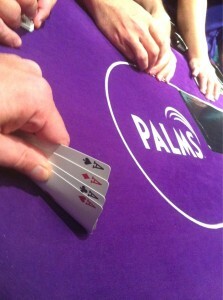 Hand of the Night: Good times from middle position for $0 with the 13th-worst starting hand in Omaha. Believe me, I realize a lot is going on in the poker world right now that you’d expect any fine folks at Pokerati to be all over … we probably are, but sometimes before pressing publish you gotta play a few hands, ya know, to remember why it is so many people have a special affection for a game that’s causing so much consternation. And because I recently blew 98 percent of my Zynga bankroll (thanks to sleepy play), pretty much my only option for a certain fix I crave is the Pokerati Game … now playing at the Palms. Check it out, the new game promo in the upper right … sweet, huh? We’re settling in to our new home nicely, buzz is spreading, and new players seem to like our kinda-sorta unique brand of half-PLO half-no-limit hold’em; the dealers are starting to figure out the slight nuances in how we play, too, and before long, anyone in the room should be able to recite rule #3a on command in English and Spanish. OK, maybe I jest … but the Palms has been really supportive of our game — so much so that they made us the nifty banner to go with my food comps. Then, just a few hours later, by semi-miraculous in-game coincidence, captured on camera from no less … I’d come to believe that four aces may well be exactly what the Pokerati Game is all about — a new kind of fun, new understanding … and perhaps even the kind of starting cards that speak to a new generation! 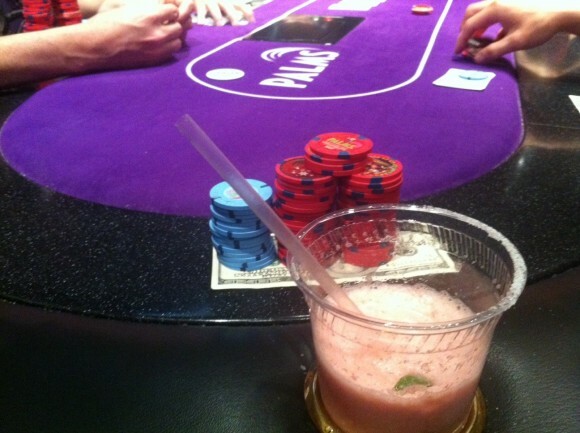 Cinco de Mayo at the Pokerati game means strawberry margaritas for everybody! Or maybe just one. Get in town on thurs….Is it PL O/8? Or high only? sad to report that i don’t know how long it’s gone the last two weeks, as i have gone busto before the game broke. on both nights it was at about 1:30a that i took off and it was still going.